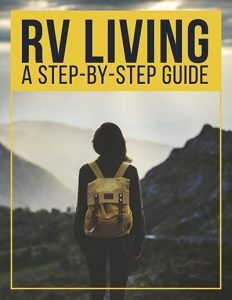 If you are new to RVing, the challenge of organizing your small space is probably a top concern. Luckily there are lots of online resources to help you with this daunting task. One of my favorites is the amazing website, Eureka. This one-stop, everything RV, site is a wealth of knowledge when it comes to smart storage solutions. Expert organizer, Andy Baird of Eureka says, “The most important thing is to learn to recognize unused space.” I agree. As any RV owner will tell you space in a rig is at a premium. 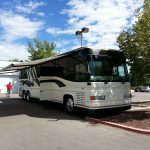 If you are camping with the kids, taking an extended vacation, or living in your RV full-time, you never seem to have enough room. Not anymore! Grab your pen and notepad, or get your ipad ready to take some notes. You’re about to be hit with a ton of storage solutions for your RV. Start by analyzing your current RV space. Begin by opening a kitchen cupboard and looking for empty space. I am not necessarily talking about shelf space, but any unoccupied space within the cupboard. Do you see it? In most cases over half the cupboard is holding nothing but empty air. For example look at the space above the dishes or in between them. What about the gap between the door and the cupboard itself? When you start looking for unused space you will be amazed by how much is there. Now think outside the box. How can you use both the shelf and the wall space to better organize your area? Could you mount a few things on the inside of the door? (If you don’t want to drill holes consider using Command Strip hooks). You could suspend your pot lids from the top of the cupboard, or mount them in an extra shallow shelf. There are dozens of ways to create extra storage if you learn to see empty space. This is not to say that you need to fill every nook and cranny. I mean, one of the main tenements of RVing is that”more is less”. If, however, you need to find a space for something, seeing the possibilities around you is key! Here’s one great example for using the inside of a cabinet door. 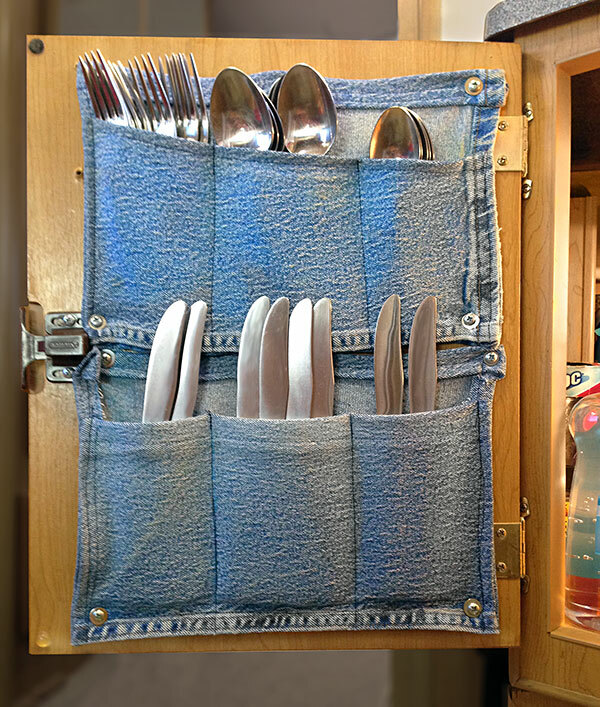 A shoe organizer or pair of old jeans can become a great place to store any number of items. Under your sink is another great place to find extra space. 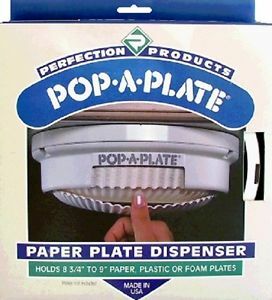 Use a pop-a-plate or pop-a-tissue dispenser, mount a battery charger, or create an angled knife rack. That space is yours to use. Create systems for the things that are important to you. You will find that organization will give you the feeling of more storage. Really look for unused space that could be better utilized. Start with one area of your rig so you don’t get overwhelmed. Once you have discovered opportunities in a small region you will be ready to expand your horizons. Look under cabinets, behind doors, on ceilings, and in nooks and crannies for unseen storage solutions. 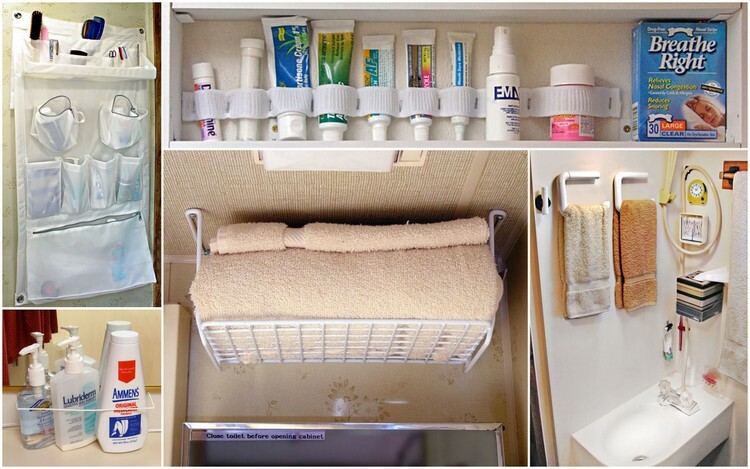 Since counter space is at a premium in an RV you want to make sure to keep them clear. Do you best to avoid storing stuff on the counter itself (especially since most of these items will need to be secured when you are driving down the road). Instead find ways to mount things on the wall, the underside of cabinets or inside the cabinet doors. If you can move it off the counter and into a different space, do it! You’ll immediately notice the improvement. Here’s an interesting example from the Eureka site. The original bathroom had little to no counter space – a common problem in many RVs. The solution was genius. He placed a hanging organizer on the wall next to his toilet and added a wire shelf to the ceiling for extra storage. Over the sink he found a way to store hand towels and other toiletries. Wow! What a great way to think outside the box. You know that drawer where you toss every odd ball tool, roll of tape, and coupon that comes your way? This kind of jumbled, wasted space is simply not efficient in an RV. Instead of a space where you throw in all the odds and ends, in your RV you need to think in terms of accessible portability. Items which are used inside or outside must be organized and stored in a way that makes them easy to carry and access. 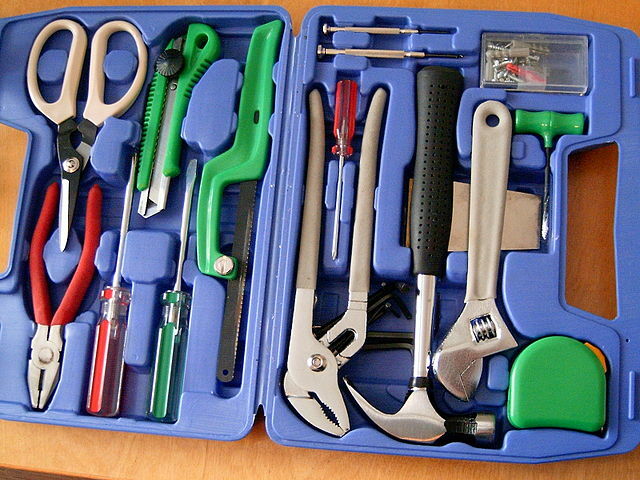 I suggest a tool bag or tool case that is easy to take with you. Every tool should have its own spot. Think of it like a doctor and his surgical instruments. The tools must be easy to reach. If you have to dig through a junk drawer, pull out your basement storage, and then look back under the bed, you lose a lot of time and gain frustration. Why do that to yourself? The key is organizing yourself from the get go. No, one tool kit does not fit all. You may need multiples, but know where they are and make them easy to get to. You’ll be glad you did! The storage spaces in your RV might look like they have a lot of space, but if you simply toss all your stuff in there you will never find anything you need. Instead, consider using one of the most popular storage options available today. Custom boxes and bins that can be found at places such as the Container Store or Ikea. I could spend hours at these stores browsing the aisles of full of unique storage ideas. You can store batteries, crafts supplies, underwear, pantry staples, shoes and so much more in bins and boxes. In my RV kitchen I have very deep drawers that makes the space difficult to use. To solve the problem I use specific containers for each item. I chose a system that fits together and allows me to efficiently store flour, sugar, cereal, oatmeal, etc. I toss the original boxes and pour the food into the air tight containers. It works like a charm. Inside a closet, you can stack storage boxes (be sure to label them) and pull out the one you need when the time comes. Always put related items in the bins together to save time. 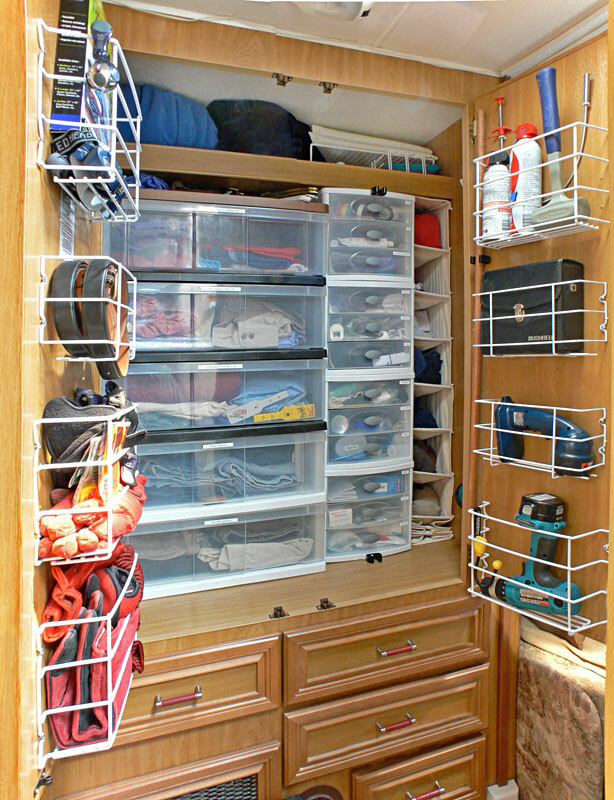 Storage drawers are another great RV organization tool. You can find plastic sets of drawers in various sizes to organize everything from pencils to sweaters. Sets of big drawers work well in your basement space beneath the rig. You can store your fittings, gloves, hoses, and everything else that rolls around underneath. Keeping everything in one place can save you a lot of time in a crisis or simply when you need to get the job done. If you need to break up the space, consider a wire shelf that fits your boxes and bins to maximize your upper cupboards. Remember, the key is finding ways to use empty space. Make a list of the items that are driving you nuts. Now look for available space and get a plan. Your stress levels are sure to decline when you find new, usable space. 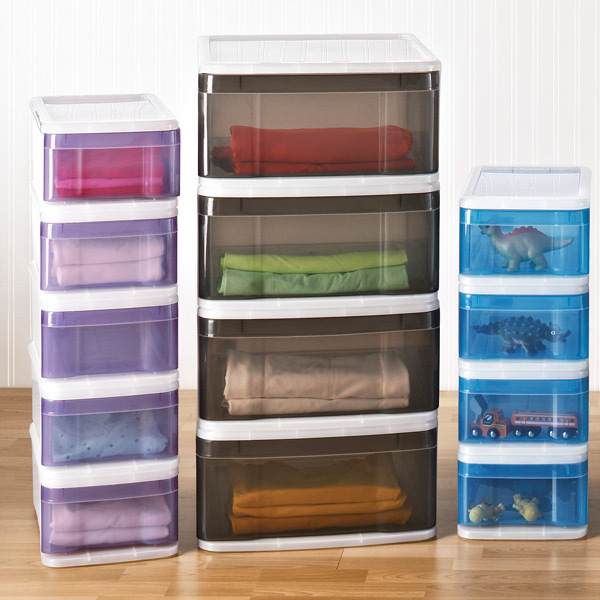 Storage bins and containers are available at most stores, but for an amazing collection find an Ikea or Container Store. These are the stores that specialize in everything that saves space. Label every storage bin. It will make your life a lot easier. You can buy a label maker, or you can print labels out on your printer. Avoid simply writing with a pen on the box. Ink marks usually rub off and make a big mess. Did you know that a square container takes up less space than a round one? It’s true. Round containers leave space gaps. Square containers fit together to use the entire shelf or cabinet. If you are storing food items, make sure that your bins have air tight seals. What’s the point of saving space if you have to toss the food at the end of the day? 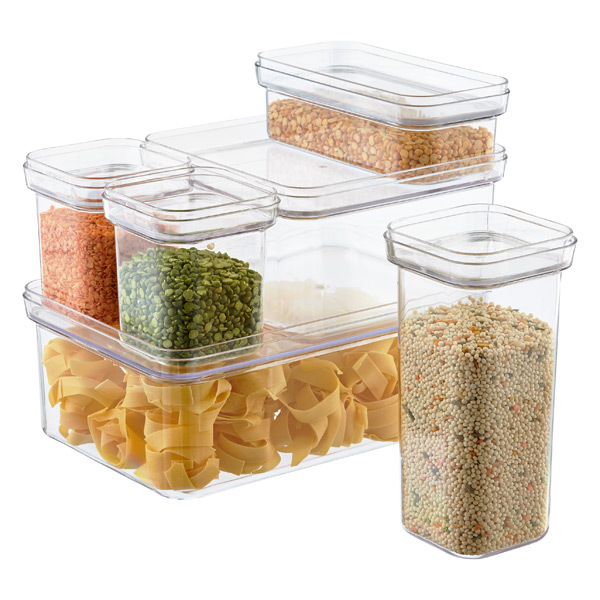 I like containers that lock, but any square or rectangle food container that seals will offer the best use of space. If you buy boxed food you have two choices when it comes to storage. You can fill and refill set containers. Or you can open the box, pull out the bag, roll down the top and clip it to the actual size of the item. Boxes make food look a lot bigger than it is. Why waste that space?Hint: Be sure to cut out the preparation details off the box and tape it to the item. You don’t want to forget what it is and how to make it! If you’re looking for a one size fits all secret, look no farther than clips and grips. Here are a few of the supplies that seem to work for just about everything! 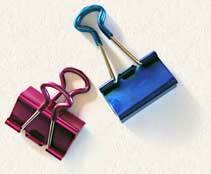 Broom Clips – They come in different sizes and mount to your rig for tons of uses. Clip a flashlight, a broom, a scrub brush or an extra rod in your closet. Mount them to the top of your basement storage and hang things from the roof. 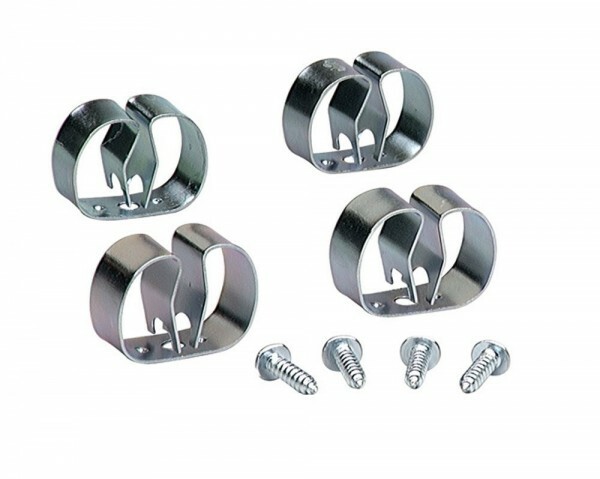 Over The Door Hooks -Over the door hooks are available in different sizes from Camping World. Use them to add a coat rack, a place for your robe, a hook for your hair dryer, etc. They fit over either a room door or a cabinet door and make a world of difference. Wardrobe space is at a premium in an RV. The fact is that only so many hangers that will fit. To better use your space, ditch the hangers and fill your wardrobe with bins. Roll your clothes and place them inside. Label each bin with the proper type of clothing. Ta-da! You have at least doubled your space for clothes. Now that’s a storage solution! There are very few clothes which have to be hung, and a simple steamer will get any unnecessary wrinkles in the blink of an eye. Also think about the clothes you have in your RV. Bulky clothing is a no-no in an RV. A better choice are thin clothes that can layered and offer some insulation value. Rethink and simplify your wardrobe. It will save you time and space. Take a look at this great example of a fully organized wardrobe from the Eureka website. Inside his wardrobe are drawers which he added. He attached the drawers with molding nails to the floor of the wardrobe to keep them from sliding. He also hung a shoe bag to use every bit of remaining closet space. Not all the drawers are used for clothes. Some of the bottom drawers contain tape, glue, Velcro and other supplies. He even found room for his first aid kit. The smaller plastic drawers connect to the bigger shelves with broom clips. I bet you could also do the same with velcro to keep them from moving around. Finally, he uses wire baskets wherever he can fit them. The wire racks that are made to fit foil and plastic wrap work great when hung on the wall and re-purposed. Wow! That’s a lot of tips, tricks and hints to help you utilize your current storage space. What was your favorite tip? Do you have any ideas that weren’t presented in this article? Leave your thoughts and comments below. Like these ideas? Share them with your friends. Post this article on your favorite social media sites or email it to your friends. Thanks for reading!